One of the most popular and beloved introductions to Christian faith ever written, Mere Christianity has sold millions of copies worldwide. The book brings together Lewis’s legendary broadcast talks of the war years, talks in which he set out simply to “explain and defend the belief that has been common to nearly all Christians at all times.” Rejecting the boundaries that divide Christianity’s many denominations, C.S. Lewis provides an unequaled opportunity for believers and nonbelievers alike to hear a powerful, rational case for Christian faith. It is a collection of scintillating brilliance that remains strikingly fresh for the modern reader and at the same time confirms C.S. Lewis’s reputation as one of the leading writers and thinkers of our age. This is months overdue and at one point I wonder if I should still write one for this book because I am not sure if I still remember the important points I have noted and underlined (Yes, I underlined parts of this book — the only time I have underlined a book again since school). But then a few friends are discussing The Screwtape Letters online and for a moment there, I thought I already wrote a review for this. Turns out I haven’t yet. Suddenly, I felt like writing one again. We may, indeed, be sure that perfect chastity — like perfect charity — will not be attained by any merely human efforts. You can ask for God’s help. Even when you have done so, it may seem to you for a long time that no help, or less help than you need is being given. Never mind. After each failure, ask forgiveness, pick yourself up, and try again. Very often what God first helps us towards is not the virtue itself but just this power of always trying again. For however important chastity (or courage, or truthfulness, or any other virtue) may be, this process trains us in habits of the soul which are more important still. It cures our illusions about ourselves and teaches us to depend on God. We learn, on one hand, that we cannot trust ourselves even in our best moments, and, on the other, we need not despair even in our worst for our failures are forgiven. The only fatal thing is to sit down content with anything less than perfection. The book buddy thread for Mere Christianity was the perfect opportunity to read it again, but alas, I lagged behind terribly for many, many reasons. Sorry, book buddies! ^^; I still finished the book, of course, albeit very, very late, and then I took my own sweet time thinking about how to write about it because I really had no idea where to start — not because I didn’t like it or I liked it too much. It’s just…different. 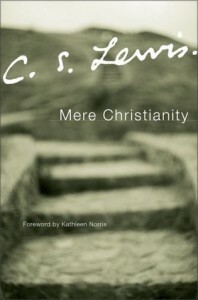 Here’s what I think about Mere Christianity (and C.S. Lewis’ other non-fiction books, for that matter): they’re not for quick reading. The C.S. Lewis books I’ve read in the past year were always the kind of books that pack a punch and would make you pause several times to reflect on what he said. Another thing is it’s not easy reading, because more often than not, Lewis’ words tend to poke at those parts of us that we hide. That’s one of the reasons why the quote above hit me a lot, because it’s the truth, and based on experience, the truth is never really comfortable at first. On the other hand, books like Mere Christianity offer a lot of wisdom, although I think I wouldn’t have understood if I read it earlier in my faith walk. Perhaps this is why I read this at this time instead of when I got it? The Christianity Lewis espouses is humane, but not easy; it asks us to recognize that the great religious struggle is not fought on a spectacular battleground, but within the ordinary human heart, when every morning we awake and feel the pressures of the day crowding in on us, and we must decide what sort of immortals we wish to be. In the end, this mere Christianity that Lewis wrote about is still a choice, the free will given to us by God in His infinite love and mercy. It’s a lot to think about. Mere Christianity is book that is meant to be read not just once, just like The Screwtape Letters, because this is the kind of book that hits you differently with every reading, depending on your current situation. The Word we study has to be the Word we pray. My personal experience of the relentless tenderness of God came not from exegetes, theologians, and spiritual writers, but from sitting still in the presence of the living Word and beseeching Him to help me understand with my head and heart His written Word. Sheer scholarship alone cannot reveal to us the gospel of grace. We must never allow the authority of books, institutions, or leaders to replace the authority of knowing Jesus Christ personally and directly. When the religious views of others interpose between us and the primary experience of Jesus as the Christ, we become unconvicted and unpersuasive travel agents handing out brochures to places we have never visited. I told you this wasn’t a review. The conclusion of the saga that began with The Magician’s Nephew. NARNIA…where you must say good-bye…and where the adventure begin again. The Unicorn says that humans are brought to Narnia when Narnia is stirred and upset. And Narnia is in trouble now: A false Aslan roams the land. Narnia’s only hope is that Eustace and Jill, old friends to Narnia, will be able to find the true Aslan and restore peace to the land. Their task is a difficult one because, as the Centaur says, “The stars never lie, but Men and Beasts do.” Who is the real Aslan and who is the imposter? So right after reading The Magician’s Nephew, I jumped straight to the last book of The Chronicles of Narnia. Given the choice, I wouldn’t really have done that just yet — I tend to let the last book of any series linger a bit longer on my shelf, because I need a certain mindset before I say goodbye to any series I have loved, or at least, invested in. But I was on a little time pressure here — I was determined to read this book for Holy Week, and it just so happened that my reading The Last Battle was also on Good Friday. In The Last Battle, there is trouble in Narnia. As a reader, I was immediately introduced to this trouble, and I already know that the Aslan parading around Narnia is false one. I think C.S. Lewis did that on purpose instead of putting the readers in a state of the unknown like the other Narnians. For the first time since reading the series, I was really and truly scared for Narnia. How could they believe that this Aslan is the real one they know? How can they believe that so easily? How can they lose all that hope so easily, too? With all this trouble, Eustace and Jill came tumbling down Narnia, to help out and save them — but the question is, do they even want to be saved? Like I said, it was the first time I was truly scared for the things happening in Narnia. I don’t know if this is investment in the series, or I was just…well, scared. Aslan is hands down one of my favorite characters, and possibly one of my favorite representations of God in literature, so seeing someone parade as a false one is scary. But in a way I can’t blame the people for acting that way. I’m not saying it’s right, but it just wasn’t surprising. Aslan being gone for a long time and with only his believers passing the belief down from generation to generation is bound to make some people question him at some point. I can’t help but think of how it is here in the real world — how people can just believe anyone and anything, and how, when disappointed by that, can make them not believe the one who should be believed in in the first place. It’s a messy, messy, thing. The Last Battle reminds me a bit of Prince Caspian, where the characters’ faith in Aslan was challenged so much that it was almost too late before they finally realized that they were wrong. The Last Battle has a darker tone compared to the other books, and perhaps it also has the most bloodshed too. There were a bit too many battle scenes in this book that I can hardly think that this is a book for kids anymore. Reading The Magician’s Nephew before this was a good idea, I think, because there were a lot of details mentioned there that was mentioned in this book. The final scenes were a bit confusing but I liked how they brought all the characters back together. I wasn’t planning to mention Susan in this review, but I guess I kind of have to. I think the Susan aspect is what makes The Last Battle a little dated. I mean, I understand what C.S. Lewis meant about it, and I guess it just so happened that Susan is that character who didn’t go the way the others chose to. It might not sit comfortably with other people, though, especially with how it was explained. I think readers should be careful to remember the time when this book was written to put the Susan thing in the proper context. Nevertheless, I think The Last Battle was a pretty good ending for a beloved series, even if it is one that can spur new questions, not about the book but about what the author intends for it to represent in real life. 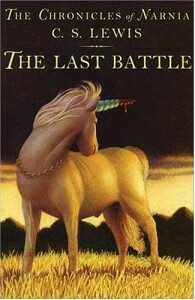 If anything, I think The Last Battle is the Narnia book that dealt the most about faith and its nature, and how it is really a matter of choosing to stand up for what you believe and for who you believe in, even if everyone and everything else around you is saying otherwise. But for them it was only the beginning of the real story. All their life in this world and all their adventures in Narnia had only been the cover and the title page: now at least they were beginning Chapter One of the Great Story which no one on earth has read: which goes on for ever: in which every chapter is better than the one before. NARNIA…where the woods are thick and cold, where Talking Beasts are called to life…a new world where the adventure begins. Digory and Polly meet and become friends one cold, wet summer in London. Their lives burst into adventure when Digory’s Uncle Andrew, who thinks he is a magician, sends them hurtling to…somewhere else. They find their way to Narnia, newborn from the Lion’s song, and encounter the evil sorceress Jadis before they finally return home. How many times have I tried reading this book and stopped? Twice, thrice? I can’t remember. But I am kind of glad my reading ADD got me to push this book deeper down my TBR until I decided to do the right thing and read The Chronicles of Narnia in publication order. But if you noticed, I didn’t really read them one after the other. They say Narnia books are best read at a specific time of the year, The Lion, the Witch and the Wardrobe being best read during Christmas, while The Last Battle during Lent. Since I want to have a dip in the Narnia world before going through the final book in the series, I decided to let The Magician’s Nephew wait a bit more after I finished The Horse and His Boy, bundling it with the last book for a Holy Week read. The Magician’s Nephew is said to be a prequel for the series, but how much of it as a prequel is something I know nothing about. I remember being confused with who Digory and Polly were, especially since I really only knew and care about the Pevensie siblings. Digory and Polly were two friends living in London who were, well, quite bored. One day, they decided to do some exploring and somehow landed in Digory’s uncle’s room, who he was quite scared of because of his strange experiments and crazy antics in their house. His uncle made them a subject of his experiment, landing him and Polly in a strange new world — another dimension, with only some rings to guide them. In this world, they meet a woman who is not who she seems, and a majestic lion whose song and breath can bring things to life. I wasn’t expecting to love The Magician’s Nephew because of my previous reading ADD experiences, so I was pretty surprised at how I reacted to the end. I loved it in the same level as how I loved The Lion, the Witch and the Wardrobe and The Silver Chair. It was written in the same children’s book way as the other books, but I guess the back story and the idea of “where it all began” fascinated me — we see exactly how Narnia was created, from lands forms to water features and all that. There was enough adventure and fun in the story to keep me invested in it (and mind you, I was reading this on a long Maundy Thursday, so there were other books that I could easily pick up over the weekend to replace this). Even if the Pevensie siblings weren’t there, I was interested in the characters, particularly Digory and Polly. 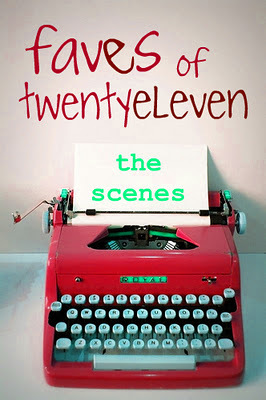 I thought Digory’s story with his mom was sweet and a bit sad, but I was glad it turned out well in the end. The Magician’s Nephew is a great example of creating a rich back story for a series, and even if it has been a while since I last read a Narnia book, the details came rushing back just as clear. This may be cheesy, but maybe it’s because a part of me has started living in Narnia when I first started reading it? I like how this ties everything neatly, and I honestly think that making this a penultimate read in the series is the best way to read it, because it makes me want to go visit the previous books to check the other details. My friend said that reading this as the first book might lessen the wonder of Narnia come second book, and I must agree with that. Of course, I’ll never know now given that I read it in a different order, but if you haven’t read any book yet and I may recommend? 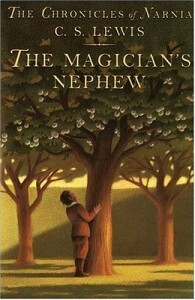 Read The Magician’s Nephew second to last. 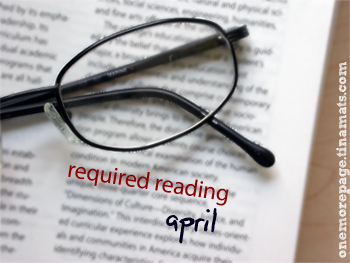 :) It would make the reading experience a little bit more magical. As usual, I liked Aslan’s presence in this book, and I liked how the final events were tied neatly at the end, explaining just exactly why some things happened in the next books. Oh, and if you’re wondering — the explanation of the lamp post is there, too.